Scaffolding is the temporary framework that is used to support workers, supplies, and other building materials during the construction, repair, and maintenance of large buildings and other structures. Scaffolding is usually made from either aluminum or steel since those metals provide the sturdiest support. These support structures typically consist of a modular system of large boards (for the work surfaces), brackets, poles, frames, beams, and pipes. All of these elements come together to provide a safe and secure temporary structure. Sometimes it becomes more efficient and cost effective for a contractor to buy the scaffolding rather than renting it from a vendor. Most scaffolding vendors will rent or sell scaffolding and scaffolding accessories. Depending on the project, the type of scaffolding that a contractor would purchase may vary although the most common types include steel tubular frame scaffolding and aluminum scaffolding. Additionally, many contractors choose to buy tube and clamp systems, multi-purpose scaffolding packages, baker scaffolds, safety fencing, and debris chutes. Often, these accessories are required for safety purposes on the construction site. When buying scaffolding, contractors must consider its safety features including the quality of the steel or aluminum, if the scaffolding is made to code, and a myriad of other factors which influence the safety and performance of the scaffolding itself. First and foremost, the steel or aluminum quality of the scaffolding should be made of prime grade metal. Cheap scaffolding, usually made of scrap metal, can easily buckle and is significantly less safe. Aside from the quality of the metal, there are two main factors that can affect the strength and stability of the scaffolding - metal thickness and the tube diameter. Remember, the thickness, or gauge, of the metal will determine its sturdiness. Metals with lower numbers are thicker than those with higher numbers. Tubes with larger diameters help enforce stability in any scaffolding structure. Any reputable scaffolding vendor will help a contractor choose which scaffolding setup is right for a particular job or project. In fact, many suppliers will be able to provide an extensive quote including a list of all scaffolding components required, just by taking a look at the drawings and blueprints associated with the project. This process can save contractors a significant amount of time and money. With the purchase of any scaffolding system, a full set of instructions for safe erection should be provided. 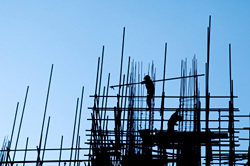 Some scaffolding suppliers even offer erection services to assist contractors on various construction projects.